Here’s a bit of needlework news that may thrill you silly. It thrills me silly, anyway! The first bit is about a sale. Oh my. Sale + Needlework Supplies = Giddy-Gladness! If you’ve been holding out to purchase some good embroidery supplies, February is a great month to do it over at Hedgehog Handworks! Hedgehog is having their annual 15% off sale, which often comes in January, but this year is for the whole month of February. Berlin Embroidery – Watch This Develop! Tanja Berlin has been developing a new project, and this is something else that thrills me silly! She’s working on a Carrickmacross lace piece, which she’ll be turning into a kit later this year. To follow the development of the development of the piece, bookmark her work-in-progress page or subscribe to her newsletter, which comes out once a month. 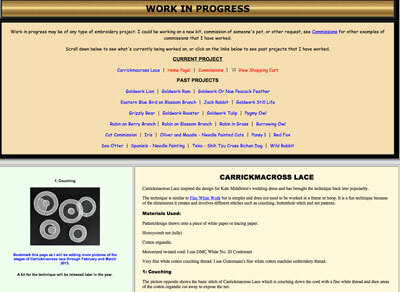 Carrickmacross Lace has enjoyed a recent burst of popularity because of its use on the famed wedding dress of Kate Middleton. It’s a beautiful lace technique involving appliqué and embroidery on a machine net (tulle) ground. I can’t wait to see Tanja’s piece develop, and will be watching eagerly for the kit! In case you have never worked one of Tanja’s embroidery kits, her written instructions in her kits are absolutely The Best! And she covers a wide range of embroidery techniques in her various kits available on her website. So if 2013 is your year to try a new technique, pop over to her website (based in Canada), and see what she has to offer. 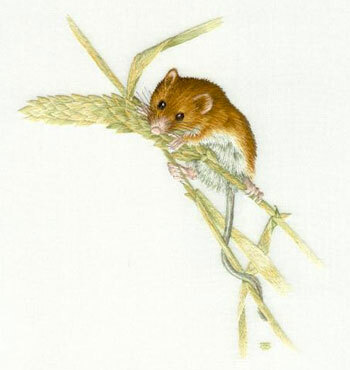 Incidentally, this little fellow is her current kit of the month, available at a 10% discount. You’ll find plenty of other needlepainting kits available at Berlin Embroidery, ranging from beginner level to advanced. You’ll also find goldwork kits, whitework kits, shadow work kits, Jacobean kits, blackwork kits…. Additionally, you’ll also find a thorough collection of goldwork supplies, of whitework supplies – the list goes on and on! When people write to ask me where they can find good instructions in a good kit to learn a technique, I always send them to Tanja first. And I can’t wait to see what she does with the Carrickmacross lace kit! So those are two things thrilling me silly this morning. I’m sure, since it’s Saturday, I’ll bump into many more equally thrilling things throughout the day – things like laundry. Housework. Monster Dust Bunnies. Oh my. I hope your Saturday is full of thrills! Thanks so much for this information I support what you have said I love both Tanja Berlin website and have regularly ordered supplies from her and I haven’t been disappointed. The same with Hedgehog Handworks they also have a good stock of needlework supplies, after researching different sites Hedgehog are the best in quality linen for embroiders. This is perfect, because I just stopped at Shibori Dragon (Tacoma WA) yesterday to see what they had, and they’re gone! Closed up, out of storefront business at least. That was my nearest needlework shop and I was just getting to know them. Sad day. So now, online ordering from Hedgehog moves up the list to #1! Love my Hardwicke Manor hoop I got last year — best hoop I have ever owned. Sale O, Sale O. The auction cry that never fails to ‘thrill me silly’! So, sounds like you’ve been running around like a chook with it’s head cut off. It’s ok animal loving people. That sight was many years ago when we had no choice but to ‘do’ our own chooks. The saying is still prevalent though so we’re not the only ones that a chook got away immediately after…well, just after! Yes, well…the sales. Love to check them all out so appreciate the nod on them. International shopping from the net is no longer dubious. I enjoy it, not that I’m a big spender but have purchased a few needlework things internationally. Kind of a kick in it when I’ve never left Australia in my life. I find the USA to be the best for overseas buying from here, on the net. They seem to care more. Thanks too for the info on Tanja. Is quite a while since been in there so will check it out again now. i was anticipating their sale this year in Jan till today, but there is no such news. 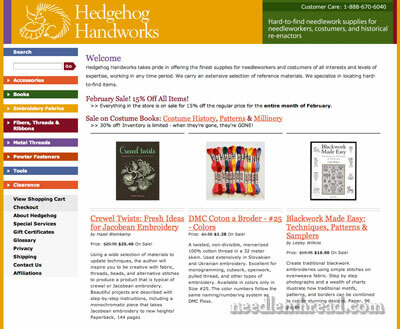 Are you aware of a forthcoming sale of HEDGEHOG HANDWORKS? Hi, Shaz – you can always contact Hedgehog and ask. I haven’t heard yet if there’s going to be one or not. I am just a cross stitcher for many years now and I developed a method (I’m sure others have done the same too) to follow a chart easier. First, using 6-8 different sharp colored pencils, I draw over each line on the chart (using yellow for horizontal and vertical center) second, using needle and thread do a corresponding chart on your fabric. This is very time consuming but you can stitch anywhere on your fabric (not just center out) and never get lost. It’s the only Way to do large charts. It keeps me from getting bored too with certain charts. Thanks, Shirley! That’s a good tip! I never thought of using corresponding colors for marking the chart. Whenever I’ve done a large chart, I generally just mark off every ten (or twenty, depending on the fabric count – on high count fabrics, generally 20) lines that correspond with the chart. I can see how using colored threads and colored lines on the chart would make it easy to see at a glance where you are. Great idea!